In the old days, that is before 2010, the oil industry used to regale the public with tales of plenty that revolved around what is commonly called "conventional oil." Conventional oil refers to oil in a liquid state occurring naturally and coming from a well on land or water. It's what most people think of when they think of oil. And, this category of oil is relatively easy to extract and refine using longstanding conventional techniques. The industry assured us that there was plenty of conventional oil in the Middle East, Russia and elsewhere to supply us for decades to come. Then in its 2010 World Energy Outlook, the International Energy Agency announced that the peak in the rate of production of conventional oil had already arrived, probably in 2006. There was some good news, however. Production of so-called "unconventional oil" would grow considerably over the coming decades and allow total oil production to rise. This unconventional oil includes oil derived from the Canadian tar sands, from heavy oil deposits in Venezuela and elsewhere, and from so-called oil shale. It also includes oil products obtained from coal through coal-to-liquids technology and those obtained from natural gas using gas-to-liquids technology. Some people include tight oil (often mistakenly referred to as shale oil) as part of the unconventional mix, though once out of the ground it is typically refined in the same way as conventional oil. Signal qualities of unconventional oil are that it is expensive and difficult to extract and refine. This has so far meant that in most cases only high oil prices can justify its extraction. And, this means that it is going to be hard for unconventional oil to make up for the decline in the rate of conventional oil production. And, rate is the key metric. As I am obliged to remind people again and again, it is the rate of oil production which matters much more than the size of the resource. The global economy is entirely dependent on continuous flows of energy and raw materials. Oil is absolutely central because it provides one-third of the world's energy and more than 80 percent of its transportation fuel. Very few things of consequence move in the world economy without the assistance of oil. Now, unconventional oil can be entirely different. Tar sands, for example, are a mixture of sand and bitumen, a thick, gooey hydrocarbon that is often used to make asphalt. The bitumen is separated from the sand using hot water. Essentially, the bitumen moves to the top and is skimmed off. This is obviously water-intensive; but it is also energy-intensive since the sands must first be mined and transported to a separation facility. Then, enormous separators filled with water heated using natural gas start the separation process. That process is repeated to get up to 90 percent of the bitumen out of the sand. But we don't yet have oil. The bitumen must be put through another energy-intensive "upgrading" process that typically strips the hydrogen off natural gas molecules and makes them available to the bitumen under great pressure and heat using the proper catalysts. Finally, the sulfur must be removed. Then, and only then, do you get something that resembles what we call oil. In fact, it is referred to as syncrude--short for synthetic crude--because it is not naturally occurring and must be manufactured. As you might intuit, ramping up tar sands production has been easier said than done. Energy writer Chris Nelder noted the gap between projected and actual production: "Let's remember that tar sands production was projected to grow from 1 mbpd [million barrels per day] in 2006 to 2.8 mbpd in 2012, but actual production is currently just 1.6 mbpd," he wrote citing a Canadian Association of Petroleum Producers forecast from 2006. Promises of 5 mbpd by 2030 ought to be taken with a grain of salt. And, 5 mbpd needs to be put in the context of a world that according to the U.S. Energy Information Administration (EIA) is projected in 2030 to consume 108 mbpd of so-called "total liquids" (which include not only oil, but biofuels and natural gas plant liquids such propane and butane.) I have my doubts that we will reach either 5 mbpd from tar sands production or 108 mbpd in worldwide production of liquid fuels given the difficulties of producing unconventional oil. Perhaps the most egregious exaggerations are saved for deposits of so-called oil shale. I say "so-called" in this case because oil shale is neither shale, nor does it contain oil. The designation was created to attract investors. Oil shale is, in fact, organic marlstone containing kerogen, a waxy hydrocarbon. Like tar sands, it must be extensively processed to yield what we call oil. Writers and analysts abound who will cite astronomical figures for oil contained in America's oil shale deposits which are found in Colorado, Wyoming and Utah. An article in The New American claims that there are 3 trillion barrels of oil contained in the oil shale of those three states, nearly twice the known reserves of oil worldwide. Of course, it isn't oil; it's kerogen, which the author doesn't appear to understand. The article cites testimony from a representative of the General Accountability Office, the nonpartisan research arm of the U.S. Congress. The witness says half that number may be "recoverable." As I am obliged time and again to remind people, recoverable isn't the same as economically recoverable. It is possible to recover rocks from the Moon. But we would never think of transporting rocks from the Moon to the Earth to make roadway aggregates. So, just how much oil from oil shale is currently available for purchase on world markets? The answer is none. There are some pilot projects which produce small quantities for research purposes, but that is all. Here it is important to review the difference between "resources" and "reserves." The writer of the articles above refers to 3 trillion barrels of reserves. But, reserves are what can be produced at today's prices from known fields using existing technology. By that definition the oil reserves of America's oil shale fields are exactly zero. Resources, on the other hand, refer to the amount of something thought to be in the ground based on rather sketchy evidence. By that definition there is still no oil contained in America's oil shale. What's thought to be there are 3 trillion barrels of kerogen imbedded in rock, which, as I said, must go through extensive processing before it can become oil. Since the early 1980s oil companies have tried to commercialize the production of oil from this kerogen-rich rock, but have so far been unsuccessful. So complex and difficult is the task of extracting and processing kerogen that the EIA has estimated that even under its high oil price scenario, the United States will produce no more than 140,000 barrels per day of oil from oil shale by 2030. That's a drop in the bucket compared to the country's projected needs of about 15 million barrels per day. Heavy oil, on the other hand, is actually being extracted in many places around the world. While the resource base for heavy oil is actually much larger than for conventional oil, typically a much lower percentage of any reservoir can be extracted. Historically, the recoveries from conventional oil reservoirs have averaged around 35 percent. The percentage for heavy oil can be as low as 5 percent though many reservoirs yield a considerably higher percentage. The point is that while people can quote large numbers for heavy oil resources, these need to be paired with an awareness that we simply cannot get nearly as great a percentage of those resources out of the ground economically as we have conventional oil. There is yet another impediment to heavy oil production which has nothing to do with physics or economics. By far the largest deposits are located in Venezuela. But the current administration has mismanaged the government-owned oil company, Petróleos de Venezuela, SA (PDVSA), which dominates oil development in the country. President Hugo Chavez's government has used revenues from PDVSA to fund social welfare programs to address the needs of the country's many poor. But this has led to a lack of investment in Venezuela's oil infrastructure and a consequent fall in oil production. Thus, for various reasons the all-important rate of production for heavy oil may not over time be able to do much to fill the gap left by the continuing decline in the rate of conventional oil production. Turning coal into liquid fuels for vehicles is now done mostly in South Africa, a holdover from the days of apartheid when the South African government feared an oil embargo could leave the country without fuel for transportation. Turning coal into gasoline and diesel is extremely dirty and extremely expensive. But South Africa paid for the equipment to do so long ago and now must simply pay for domestic coal to supply its coal-to-liquids refineries. As for processing natural gas into liquid fuels using gas-to-liquids technology, it is capital-intensive and currently only suitable for turning what is called "stranded gas"--natural gas that would otherwise be flared into the atmosphere--primarily into diesel. I should say a few words about tight oil because it is often mistakenly referred to as shale oil, even though that term is more properly interchangeable with oil shale. Tight oil does indeed come from deep shale deposits, and it is released through hydraulic fracturing or fracking, the same process that is causing so much controversy when it is used to release natural gas from deep shale. Tight oil does not really fall into the unconventional category since it produces oil that is suitable for conventional refining. While hydraulic fracturing is not new, the particular form of it used to make tight oil deposits flow has only been in widespread use since 1998. This form has made previously uneconomic deposits of oil in such places as North Dakota profitable to extract. U.S. oil production has risen recently as a result. But the EIA projects that production of such oil in the United States will top out in 2030 and then decline even as overall U.S. oil production hits a secondary peak earlier in about 2020 and then starts to decline. (The United States hit its all-time oil production peak in 1970.) Total "recoverable" resources of tight oil in the United States--remember, they're not necessary economically recoverable--are put at 24 billion barrels, or the equivalent of 288 days of world supply. Based on what we know today, tight oil production will not do much to overcome the loss of other conventional oil production worldwide. 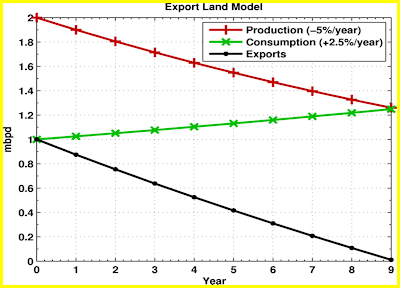 Finally, there is the seemingly esoteric question of Energy Return on Investment (EROI). Simply stated, it takes energy to get energy. More than a century of cheap energy has made us forget this critical fact. As we exploit ever more difficult-to-get energy resources, we are obliged to spend ever increasing amounts of energy to get them. When the EROI of a seeming energy resource reaches one--that is, when it takes one unit of energy to obtain one unit of energy--that resource ceases to be a source of energy. The United States is thought to operate at an EROI for all energy sources of about 40 to 1. It is hard to imagine running the country entirely on fuels such as oil from tar sands which has an EROI between 5.2 and 5.8 to 1. For oil shale there is little to go on since there are no commercial-scale operations. But available estimates tell us something about why this resource has never been successfully commercialized. Reported EROI ratios are between 1.5 to 1 and 4 to 1. Compare this to between 12 to 1 and 18 to 1 for oil imported into the United States. As we as a species continue to exploit energy resources that are more and more energy-intensive to extract, we will find out the true meaning of "net energy." That is the energy left over after we find, extract, refine, and deliver energy to its user. Net energy is what everything in society except the energy industry runs on. Right now in the United States, if the 40 to 1 ratio for EROI is correct, then about 2.5 percent of our energy is spent getting energy. That leaves plenty for all the other things we want to do. But if we come to rely on an array of low EROI fuels, we may soon find that vast portions of our economy must now be occupied with energy gathering. 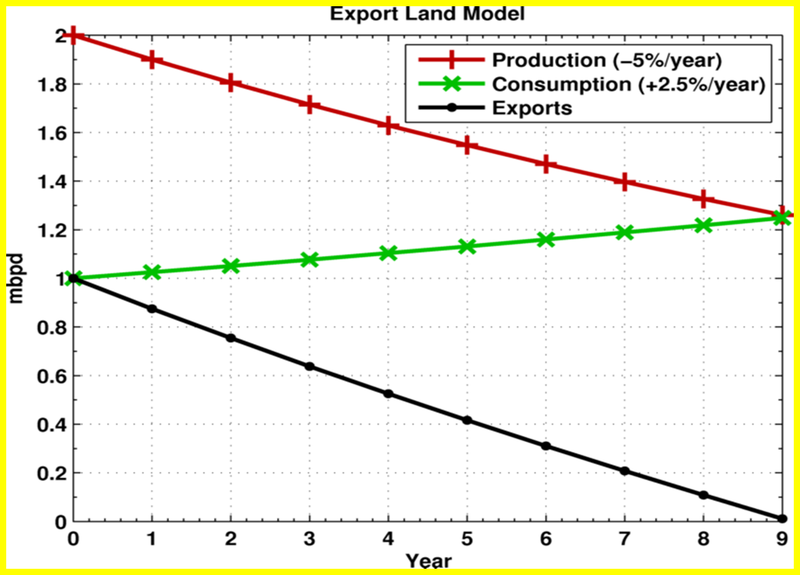 A drop to a 10 to 1 average EROI implies that 10 percent of the economy would be devoted to energy extraction. That's four times the current size of the energy sector in the United States. A drop to 5 to 1 implies that 20 percent of the economy would be involved in energy extraction. This progression is called the "net energy cliff", and it augurs enormous changes in the way we structure our economy and our lives if it comes to pass. Those changes are, in fact, already happening as we realize that unconventional oil won't be cheap. It's unlikely to be plentiful either because unconventional oil will be challenging to produce at the same high rates we've been producing conventional oil. And, the low EROI of unconventional oil should tell us that we cannot count on it to provide as much energy to society as we are used to from much higher quality fuels. All of the foregoing flies in the face of the (wildly misleading) conventional wisdom about unconventional oil. But if we are to make intelligent policy and personal decisions about energy, we will be better prepared if we work with the available evidence rather than relying on the oil industry's pronouncements of wonders yet to come. This is the first of a six-part series introducing readers of The Christian Science Monitor to concepts useful in understanding the Resource Insights blog. Selected posts from Resource Insights will begin to appear on the Monitor's Energy Voices blog starting this month. Perhaps the best example of the oil industry's "Wrong Way Corrigans" is industry mouthpiece Daniel Yergin, head of Cambridge Energy Research Associates (CERA), a prominent energy consulting firm. For a long time Yergin has been a frequent guest on prominent television news programs and a source for many print journalists. He is a darling of the media on energy issues, a media which is too polite to confront him with his abysmal record of predictions in the oil market. He was wrong in his public pronouncements every step of the way from the 1998 low in oil prices right up to the all-time highs of 2008, frequently predicting a large buildup of new supply and crashing prices. (One wonders why clients of CERA continue to buy the company's research when it has been so wrong for so long. But that's a story for another time.) Only at the end of 2008 did oil prices finally crash and then only because the world economy was headed into the worst economic decline since the Great Depression. But as soon as the economy revived even tepidly, prices rose back to $80 a barrel and then above $100 which is about where they are today. The simple answer is that we've exhausted the easy-to-get oil and are now left with mostly the hard-to-get oil. It only makes sense that the early oil pioneers harvested the easy oil first. Why go after the hard stuff at that point? We've since learned how to extract oil that is much harder to develop. This includes deposits far offshore and deep below the seabed as well as those locked in the Canadian Tar Sands, deposits that must undergo expensive and energy-intensive processing to convert what is really bitumen, a goopy, thick hydrocarbon, into what we call oil. Peak oil does not mean we are running out of oil. This is a canard used by the oil industry to confuse the public. Nobody who understands world peak oil production ever says that it means we are running out. In fact, we won't run out of oil for a very, very long time. At the peak the rate of production will cease to rise, probably trace a plateau for a time, and finally begin a possibly slow and bumpy decline. That means we'll have less and less oil available each year. As oil becomes more and more expensive, we will use less, and we will ultimately reserve it for critical purposes for which we cannot find good oil substitutes. Peak oil does not mean that we won't find any more oil. We are finding oil every day. We're just not finding enough and putting it into production fast enough to grow production in the face of declining flows from existing fields. Peak oil does not mean the immediate collapse of modern civilization. However, if we stand still and do little to address oil depletion, peak oil will likely result in immense difficulties. To further illustrate the importance of rate, consider the following: Half of all oil consumed since the beginning of the oil age has been consumed since 1985. We consumed exponentially larger amounts nearly every year until 2005 when a number of factors conspired to constrain supplies. We frequently hear about multi-billion barrel discoveries and think (wrongly) that oil must surely be plentiful as a result. So, here's another question to ponder: How long does one billion barrels of oil last the world at current rates of consumption? If you guessed something close to 12 days, you have a sense of the enormous challenges humans face in extracting finite resources at ever higher rates. Just multiply those multi-billion barrel discoveries by 12 to find out how many days the oil age might be extended by each discovery. You'll find the answer is, "not many." The more immediate problem for oil company executives is that their companies may soon find it impossible to replace all their oil reserves. Oil companies strive to replace at least 100 percent of what they produce so that their reserves don't fall. If investors come to believe that a failure to replace reserves will be ongoing year after year, they will mark down oil company share prices significantly. In fact, it's already happened, and it's likely to happen with more frequency as more companies struggle to reach 100 percent replacement. Such share price declines would, of course, make a lot of oil executives significantly poorer as the value of their stock and stock options plummet. Essentially, oil companies would be recognized as self-liquidating businesses. Starting next week posts from Resource Insights will be regularly featured in The Christian Science Monitor on its new "Energy Voices" blog. The highly respected Monitor has a century-long tradition of reasoned, thoughtful journalism which has earned it seven Pulitzer Prizes and many other awards. Its global reach--it stations writers in 11 countries--will bring a large new audience in contact with my work. Most of these new readers, however, will not have the background on energy and resource issues that I have been presuming my current readers do. If I provide no preparation for these new readers, it will be as if they are entering a theater in the middle of a play without knowing any of the preceding action. Therefore, in an effort to introduce key concepts and ideas to this new audience, I am undertaking a six-part series that will in most cases revisit ground I've already covered. The first installment of that series will be posted this evening to allow ample preparation time for next week's debut of the Monitor's "Energy Voices" blog. While those of you who have been reading me for a relatively short time may find this series a useful refresher, others who are longtime readers may find it occasionally elementary. I ask current readers to indulge me for the time being because I feel it is critical that this vast new audience be introduced to concepts and ideas that will allow it to catch up quickly. When the series is complete, I will resume my search for new perspectives on the themes of resource depletion, climate change and related topics, hopeful that new readers at The Christian Science Monitor will be able to follow my thinking as readily as longtime readers do now. Thanks to all of you who read my work regularly. I consistently find your comments and emails thought-provoking and gratifying. Over the next few weeks I ask you to join me in welcoming the readers of The Christian Science Monitor to Resource Insights.